What Would You Do To Live? Dead of Winter is an experience that can only be accomplished through the medium of tabletop games. It is a story-centric game about surviving through a harsh winter in an apocalyptic world. The survivors are all dealing with their own psychological imperatives but must still find a way to work together to fight off outside threats, resolve crises, find food and supplies, and keep the colony's morale up. 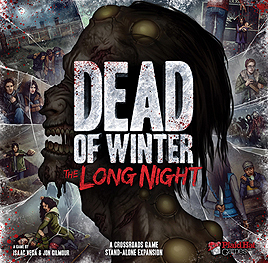 The Long Night introduces the Raxxon location where horrible experiments will spill out into the town unless players can contain them. It also introduces bandits and their hideout location, colony improvements, the graveyard location, an all new cast of survivors, all new zombie standees, thick cardboard locations, new items, all new main objectives, all new secret objectives, all new crossroads cards, special scenario play and much more! A Crossroad Game Stand-Alone Expansion.